With Leaf's checklist release of their upcoming ITG In The Game Used product (and subsequent 20 new Linden cards to chase....most of which are limited to 9 copies or less....don't get me started), my quick calculations show that Trev now has over 2000 different cards that have been released. It's been quite the adventure since the 2010/11 season when Linden was inserted into sets as a retired player as opposed to the occasional inclusion into a product as an aging veteran. 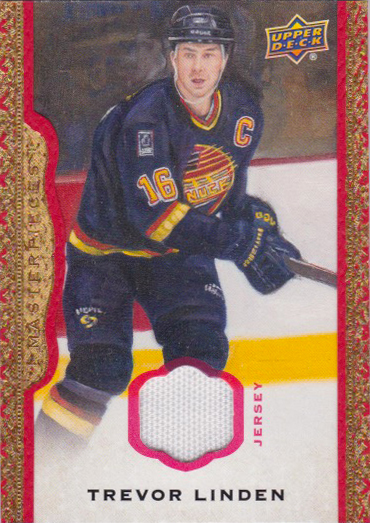 Add to that the 'new kid on the block' - Panini as well as In The Game's knowledge that Linden was a fan fave among hobbyists and the checklist ballooned....fast. 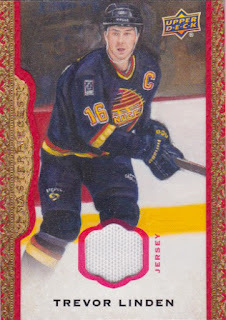 Leading into the 2010 season, Linden had around 1200 cards (according to my master checklist). That's over a 22-year span. In the past 6......800+ cards. Parallels galore and insertion into numerous products created a bit of an oversaturation in my opinion. But that's how the hobby world has decided to structure itself and so I tackle the challenge in my own way....at my own speed....and with my own decisions on what to buy and when. So let's take a quick look at the recent pickups (to celebrate in a way). This card came from last year's ITGU offering. A healthy 42-card chase that had me quite disinterested early. I've slowly picked off a card here and there still have less than a quarter of the cards available. And the prices on these in the secondary market - plummeted. That's good news for me.....and it's the only reason why I took a stab at this one. 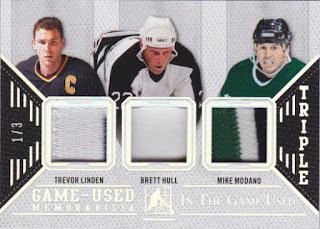 Definitely not because of the killer swatch pieces (Modano is nice). 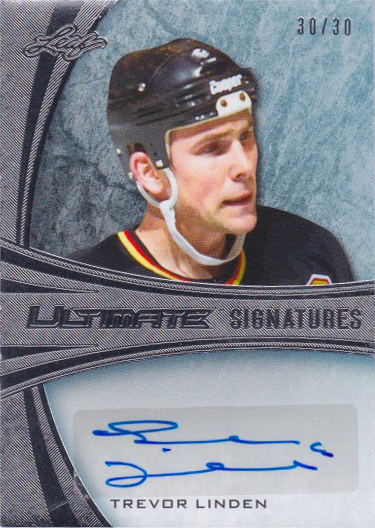 I must admit....I bought this card mainly because I could cross it off the list. This auto finishes the rainbow of cards from this set (I don't count 1/1s anymore in the quest). Would've been a killer card if it was hard-signed. Funny thing is I bought this one way back through COMC and since then have picked up the /9 for about the same price and the /3 for less money. This hobby makes me laugh sometimes. This one had me laughing as I forgot that I needed it. I've passed many copies on eBay with nary a look. Then I decided to update my wantlist and discovered the hiccup. I didn't rush to grab this one (still looking for a good value on one) and when this one reared its ugly head I struck. It might be the first time I enjoyed chasing a white swatch. Price was right and it finished off the tidy 7-card Masterpieces chase. Now that was fun. If only they could've improved on the picture....the older Masterpieces release was way nicer. Scary to think that this red memorabilia parallel was the most exciting card of the three for me to check out. Funny how cards sometimes work that way. Scarcity doesn't always equal desirability or value. So that's three new cards to the collection. I've got more to share, but that'll be for another day. 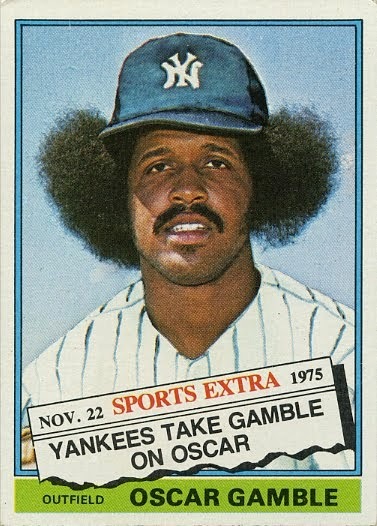 And a celebration of hitting the 2000 card plateau. I'm curious to see how long it will take for this hobby to hit 3000 Linden cards? I hope (and expect) it will take longer than 6 years.